In 1948 the schools in Hertford were run by a group of managers which held regular meetings, once a term. What follows is the early days of Morgans Walk School as seen through the minutes of these meetings. There was obviously a need for another school and at the managers’ meeting held on 12th July, 1948 a member of the County Architect’s Department produced plans and models relating to the new primary school in Morgan’s Walk which has to be included in the 1948-49 programme. By Thursday, 9th December the ground plans and elevations of the new Morgans Road J. M. I. School were available for inspection. At the meeting of managers on 6th February, 1939 attention was drawn to a recommendation of the County Education Committee for the purchase of 15 acres of land on the Brickendonbury Estate as a site for a senior and a junior school. Presumably this purchase went ahead and had it not been for the war the school would have been built much earlier. Why a senior school was not also built on the site is not known although later, in 1953, part of the site was given to Hertford Grammar school as a sports’ field. At the meeting, in March 1949, the managers recommended to the Divisional Executive that, as a result of prospective overcrowding next term, the catchment area of Fuadel Phillips School be limited to exclude the Hornsmill Estate. The headmistress was asked to warn parents concerned so that they might make alternative arrangements for the subsequent term! In July, 1949 it was recommended that, if there was no possibility of the school opening within three weeks of the commencement of the Spring Term, the opening should be deferred to the Summer Term. Also applications for the headship were available for inspection. It was not until the meeting on 9th February, 1950 that the Assistant Divisional Education Officer reported that the school would open in the Summer Term with an estimated 200 children, head and six teachers. (Port Vale School would have 190 children down from 202 in Jan; Abel Smith 176 from 225 and Faudel Phillips 174 (with 4 teachers!!) from 216). The managers wanted someone eminent in the educational world to open the school. The first headmaster of Morgans Road School was Mr W E Elliott, who gave his first report to the managers on 15th June 1950 when the number on roll was actually 235. By this meeting it was agreed that there would be no formal opening of the school (what happened to the eminent person?) but there would be open days instead. It was now recommended that the new school be named Dunkirks Primary School (presumably after the farm nearby). Defects and weaknesses in the building and its planning were to be forwarded to the County Architect. On 26th October it was agreed to accept the Divisional Executive’s recommendation that the school be called Morgan’s Walk C P School. Someone was obviously querying this name as on 15th February 1951 it was agreed that the name of the school should not be altered. At the October meeting the number of clerical hours was increased from 5 to 10 and the DEO asked to press for the early repair of window frames and glass!! At the February, 1951 meeting it was recommended that 10 clerical hours (is this on top of the previous mentioned 10 hours?) be granted to the school because of inexperienced teachers and visitors demanding so much of the Head Teacher’s time! Posts of special responsibility were recommended to Mr Simpson £75 and Miss Riches £40, which would require £15 from Pool!! By 14th June the managers wanted to know how much of the posts of special responsibility had been awarded. It was also recommended that an extra teacher be appointed in September. The managers wanted a report from the County Architect on action being taken to overcome defects highlighted in the February meeting. The grass needed to be cut efficiently and capital expenditure was agreed for bench seats in the garden. The Headmaster was asked to convey thanks to the staff for their assistance during Festival Week when the school was open to visitors. Was this the official opening of the school? By the meeting of 18th October, 1951 all the possible repairs had been effected, DEO reported that the additional clerical assistance could not be granted, the grass was now satisfactory and the sums allocated for posts of special responsibility were Mr Simpson £60 and Miss Riches £40 (so presumably the £15 was not available from Pool!). The provision of an extra teacher was now recommended for January!! By 14th February, 1952, Major Woodhouse reported that door springs and drinking fountains were still unsatisfactory but were receiving attention. It was finally agreed that the posts of special responsibility be allocated, (it had only taken a year for this to happen – that’s one way of saving money!!). Also the (Hornsmill?) Sunday School was using the school and the DEO was asked to contact organisers informally to ask if its parties could be held during the holidays or later in the evening to avoid disturbing school attendance! At the meeting on 29th May, 1952, the Head Master was complaining that the Monks Green coach was continually arriving late and was generally unsatisfactory – the DEO was to take this up with Highway Coaches Ltd. The Head Master was congratulated on the high percentage of children who gained interviews for the County Entrance Examination. The chairman agreed to write to the children congratulating them on the excellent spirit shown by their efforts to clear the playing field of stones (still a problem today)!! The next meeting was held on 30th October, 1952 at Longmore Secondary Modern School. There were obviously problems with numbers of children since the report on the estimated numbers on roll at the various primary schools requested at the last meeting, produced the following recommendations – the canteen be provided with screens or curtains so that it could be used as an additional classroom; that the partition between the doctor’s room and the medical waiting room be adapted; and the radiators moved where necessary so that the two rooms could be used to accommodate a class of 30 children. On 12th February, 1953, the managers were pressing for the curtains for the canteen be provided so that it could be used as an additional classroom. The head teachers were now asked to keep a record of the times of arrival and departure of the Monk’s Green coach. The question of raising the cycle shed was receiving Mr Fardell’s personal attention! The managers agreed to recommend the provision of an additional blackboard and cupboard and they recorded their appreciation of the formation of a Parent/Teacher Association. The Head Teachers were asked to report from time to time on the way the new financial arrangements were working. By 1st May 1953, the resignation of Mr Hudson had been received and the appointments of Miss Peach in April and Mrs Radford in September were confirmed. Mr Elliott suggested on behalf of the head teachers that financial reports be given at the beginning and end of each financial year and this was accepted. The way the Hertford and district schools were run was under review and at a meeting of the governors of Hertford Secondary Modern School and the managers of Hertford Primary Schools with representatives from Walkern C P School Managers and Hertford R C School managers on 1st May, 1953, resolutions were passed to request that the County Education Committee be informed that they wished to amalgamate to form one body. It was also proposed to hold an education conference for Hertford and Rural District each summer and that the head teachers should attend. The first conference was fixed for 10th July at 7 p.m.
By 17th July, 1953, the body was now called the Governors of Hertford Secondary and Primary Schools and this meeting was attended by Mr C G Stalley, Head Master, Cowper & Longmore Secondary Modern Schools. By 29th October, 1953 the resignations of Mrs Shaw and Mrs Laven had been received. It was requested that climbing ropes could be supplied in the hall as well as storage space under the stage. The conversion of the medical rooms (first requested one year previously) had not been included in this year’s main capital items list but had been put forward again for next year. Pin board material was being requested from the County Architects Department and DEO was requested to explore ways of the Headmaster being reimbursed for small items such as washers if he bought them for the caretaker!! On 11th February 1954 the governors asked the headmaster to convey their congratulations to the Staff and children on an excellent performances of “The Magic Key”. The cost of storage space under the stage (estimated at £11.13.6d) should be met from school funds. The Governors congratulated the Headmaster on the savings effected in heating, lighting and water costs!! On Thursday, 14th October 1954 it was agreed that Mr Williamson would be seconded to Bayford School as a temporary Headmaster. Thanks were expressed to Mr Brooks for the gift of a silver spoon and to Mr and Mrs Moxom for the gift of a wooden chess piece (presumably the large wooden queen still being used at the school!) . The DEO reported that the external painting would be included in the 1955/56 programme. The rivets had been received (for the chairs!) Also the staff were now allowed to have free use of the hall one day a week! It was agreed to recommend that the Herts agreed syllabus for Religious Instruction be reprinted in separate sections (Primary and Secondary) so that the schools could buy the appropriate one. On Thursday, 10th February, 1955 the school visitors reported a satisfactory visit. Mr and Mrs Rose had presented a silver cup in memory of their daughter. The Headmaster gave the Governors a summary of the financial position and informed them that the experiment of the school controlling its expenditure on fuel and lighting was currently in abeyance. The first mention of the swimming pool occurs with the Headmaster outlining the scheme for a “learner’s pool” which the PTA was prepared to sponsor. A resolution was passed approving the scheme and recommending that the County Council give its full support and, if possible, a grant. Mr Wallace was elected as at the governor’s representative on the special committee formed by PTA to deal with this project. On Thursday, 9th June, 1955 received with regret the resignation of the Headmaster, Mr. Elliott. He had been appointed to the Headship of a large primary school in Havant. The Chairman congratulated Mr Elliott and wished him happiness and success and thanked him for all he had done to establish the school on “good, progressive lines”. He was also congratulated on the excellent report of the school from H. M. Inspectors as a result of the recent inspection and asked to convey the Governor’s congratulations to the staff. The swimming pool was progressing satisfactorily after a grant from the County Council. The Governor’s congratulated the school on its sporting success. The resignations of Mrs M Radford, Miss N Cooper and Mr J. E. Stinton (later to be Head of the school!!) had been received to take effect at the end of the school year. The Borough was to be asked to make up part of the road near the school. The Planning Authority had been asked about the possibility that Hertford Grammar School could be given part of the Morgans’ playing field. On 13th October, 1955 Mr R W Elkins was now head. In future children would not be admitted before the term in which they became five years old. The swimming bath was making good progress and it was hoped to acquire the chlorination plant from Tewin Water which was too small for its pool. The caretaker’s request for overtime for stoking the boiler had “not been met” and the head would take this up with the appropriate department at Count y Hall. The Governors expressed their appreciation of the Harvest Festival Service the children had held. It was decided that in future the Infants would finish at 3 p.m. The road to the school had still not been made up but Mr Patmore hoped it would be done soon. On 23rd February 1956, it was recommended that Mr Simpson should be awarded a special allowance of £60 and that the remaining £40 should be reserved until an experienced teacher could be appointed to take charge of the Infant department. It was agreed that PTA should hire the hall(!!) for a dance to raise funds for the swimming pool, at a charge of £1.15.0d. Children would now only be admitted to Hertford Primary Schools if they reached the age of five by the end of the first month of the term. On 31st May, 1956 it was recommended to the Education Committee that no further action be taken on Nursery Classes in Hertford Schools until “the population had settled and it was clearer where space would be available.” Mrs Malec was confirmed as Head of the Infant Department, retrospective from 1st April 1956, with the special allowance of £40. The Head asked for the removal of the partition and the small section of wall between the medical and waiting rooms (first raised in October 1952!!) which resulted in the Chairman agreeing to inspect the rooms and making a recommendation at the next meeting. The Boy Scouts Association was given permission to use the school on 31st July 1956. Meetings were now held in rotation around the schools. On 11th October 1956, DEO outlined the Burnham committee’s new recommendations for the allocation of special posts. As the Hertfordshire scheme for its administration had not yet been accepted by the County Council, allocation of these posts within the Primary Schools could not be dealt with but the Chairman was authorised to deal with Heads’ recommendations in due course. The resignation of Mr Peck (appointed head of a primary school in Suffolk) and Mrs May were received with regret. The removal of the partition and the small section of wall between the medical and waiting rooms to provide extra classroom space was recommended and it was agreed to ask the County Council to accept the Parents’ offer to provide the necessary money and labour if the Divisional Surveyor could supervise the work. The PTA were now going to provide fencing around the swimming pool. On 28th February 1957 the managers again considered the combining of the doctor’s and waiting rooms into one and still thought it should happen even if numbers were to fall. The mangers did not consider it desirable to have a tuck shop!! The DEO informed the managers that in order to spread available teachers more equitably over the country, the Ministry of Education had assigned each LEA a quota. 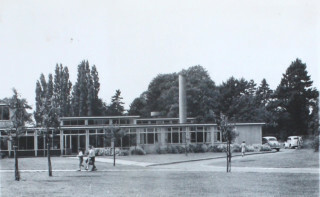 In order to come within this quota and still staff new schools and additional classes, the Hertfordshire Authority would have to reduce the present establishment in some primary schools and Morgans Walk would have to lose one teacher in September 1957, to become the Head and nine teachers. The managers approved the use of the swimming pool by non-swimmers from other schools provided the extra cost of chlorination did not fall on Morgans Walk and the schools full use of the pool was not affected. The provision of extra pegs and coconut matting in the changing rooms was approved. The Divisional EO was asked to obtain a report from the County Architect on the women’s cloakroom were there appeared to be no ventilation. Leave of absence was given to Mrs Stevenson for a week in May to attend the annual camp of 301 East Anglian Battalion Territorial Army, WRAC in which she was a company commander. At an Extraordinary Meeting of the managers on 28th November it was resolved that children from any part of Hertford could be admitted as long as accommodation was available. I read the above with great interest as I attended Morgans Walk in the years 1952 to 1956. I was at the opening day of the new pool – I was selected to swim a length in front of all the parents etc. The pool had only just been filled up with ice cold water!! I remember all the teachers well, Mrs Robinson was a lovely lady and Mr Peck was a very good teacher. I remember going to Mr Elliots headmasters office in 1953 to pick up my Coronation mug. I was a pupil here at this time, my father was one of the parents who built the pool. Remember the ‘Storage Space’ under the Stage very well. Spent much of my mis-spent youth (in the 50s) hiding/playing in there! Also remember the pool – it was always freezing.